There’s a lot to like about Space Run Galaxy. 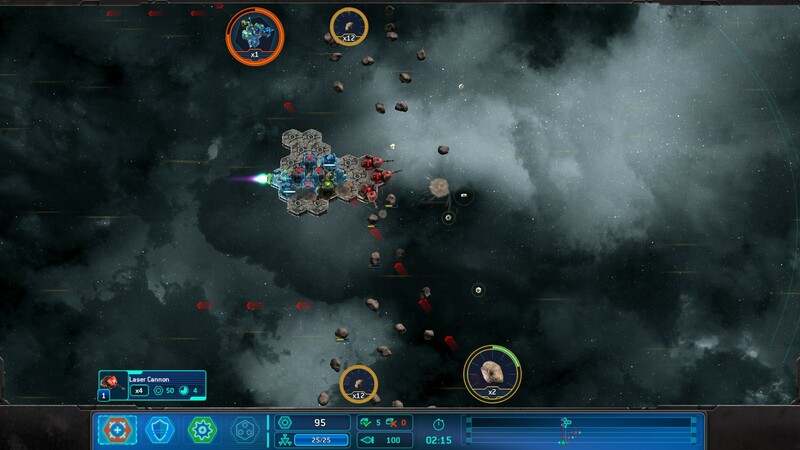 A sequel to the original Space Run that released just over two years ago, Space Run Galaxy takes the formula of traditional tower defence and invigorates it with a sense of urgency and a set of compelling progression systems that no other entry in the genre can currently match. Cast as an intergalactic courier, you are tasked with taking on contracts that require you transport varying quantities of cargo from one place to another. Of course it isn’t quite so simple as that because along the way you find yourself and your cargo waylaid by all manner of things from asteroids to space pirates, aliens and much, much more. Levelling up allows access to a range of new upgrades for your ship. With contracts awarding precious experience points and resources that can be reinvested in strengthening your ship, Space Run Galaxy doesn’t just impress upon the player the need to make it through a run in one piece, but to do it quickly since faster runs award more goodies as a result. In short then, Space Run Galaxy is quite unlike any other tower defence title out there and while a touch flawed, it still manages to breathe fresh life into an increasingly tired formula. A big reason why Space Run Galaxy feels so different from its peers is because of the setting. As a space delivery agent, the emphasis is very much on getting from A to B in the quickest fashion you can but to do so you must decide how much of your ship you want to devote to engine power. The thing is you see, before you embark on a run you only have a finite number of spaces on your ship to mount guns, shield generators, engines and any other sort of upgrade that you might have in mind. 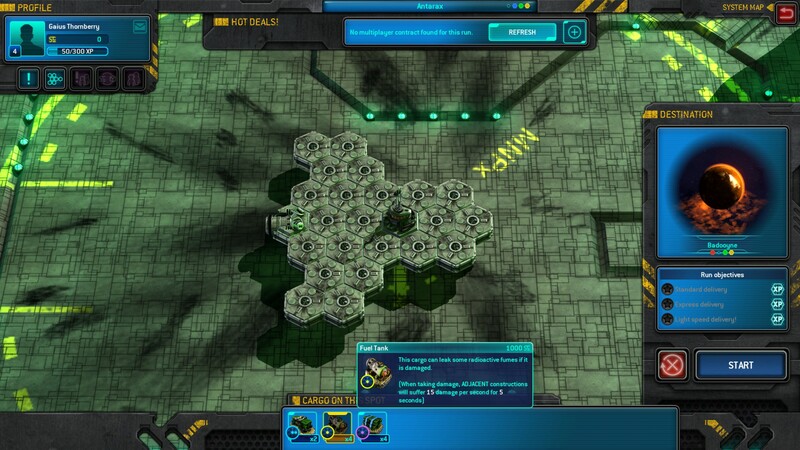 While you can increase the number of hexagonal spaces on your ship to a certain limit and even buy whole new and much larger ships altogether, the notion remains the same; you need to carefully consider how you use the space afforded to you. Because of this, Space Run Galaxy feels like a much more intelligent and tactical than your average tower defence affair because it forces the player to consider both the tactical and logistical imperatives at stake. Complicating matters yet further is the nature of the cargo itself. In addition to taking up precious space on your ship that could otherwise be used for something a little more functional, some cargo has special characteristics that can adversely affect your ship if compromised. A fuel tank for example, when ruptured, might cause a fire that spreads across the rest of your vessel, damaging your offensive and defensive capabilities in addition to any other cargo that you might have. As much as Space Run Galaxy separates itself from the genre status quo, it does still largely adhere to many of its cornerstones. 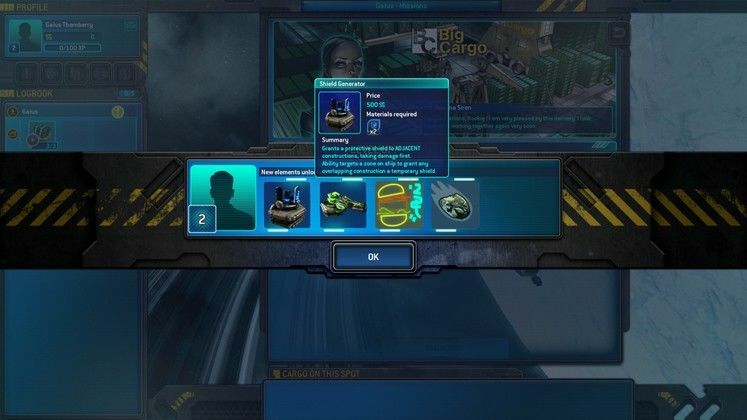 Attack towers, such as laser turrets and missile batteries, must be balanced out with supporting elements like shield generators, while the typical upgrades that towers normally get in these games are only available if an upgrade unit is placed adjacent to the tower that you wish to improve. 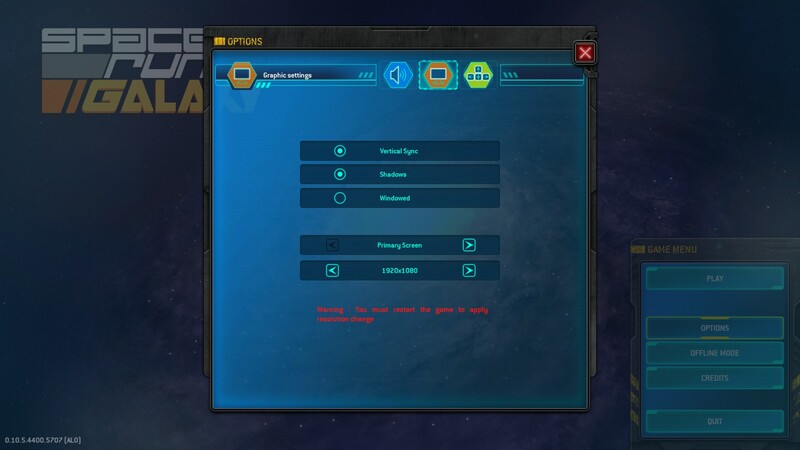 Another odd little wrinkle, is that when you place your attack towers, whether they be laser cannons, missile launchers, ion cannons or whatnot, you have to specify the direction in which they are pointed before you place them with no option to tweak this after. With enemies attacking potentially from all sides, you need to get your placement right lest your firepower be pointed in entirely the wrong direction when the enemies arrive. Of course this results in frustration initially, but soon you find yourself becoming less haphazard with your tower placement and instead waiting to place them as when you detect incoming foes and not before. Ultimately, the game teaches patience and poise and its a lesson that’s well learned as you progress through it. Sticking engines on the back of your ship isn’t just good for making you get to the end of a given run faster, it also provides an uptick in focus points that can be parlayed into special abilities for any of your towers to use, ranging from a rocket volley or a ship-wide repair depending on the tower you have specified. Ostensibly, there’s so much to take in with Space Run Galaxy that other entries in the genre feel slight by comparison. 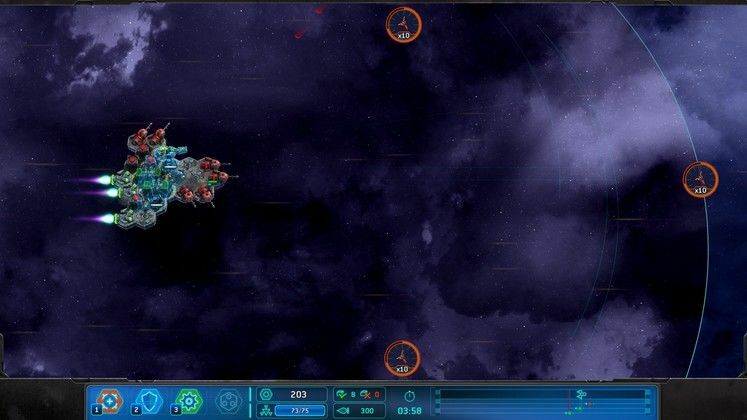 Backed up by a neat set of progression systems that gives completing main missions and secondary missions a real incentive by allowing you to get your hands on bigger and better upgrades and ships, the allure of Space Run Galaxy is not one that is easily dulled at all. With all the action taking place from a slightly slanted, top-down perspective, Space Run Galaxy is not a game that will make your shiny new Geforce GTX or AMD R9 card even sweat in the slightest. That’s not to say it’s an ugly effort; it most certainly isn’t that but the simplistic looking ship models, understandably sparse environments and generally conservative lack of on-screen visual effects means that Space Run Galaxy veers much more towards the functional than the attractive. In terms of graphics options, there isn’t much to report really. Aside from being able to tweak the screen resolution, shadow quality and toggling of v-sync, Space Run Galaxy doesn’t offer any other recourse for adjusting its visuals. Running the game on my system that encompasses a 2.8GHZ i5 CPU, Geforce GTX 670 and 16GB of System RAM, I had no problems whatsoever from a performance point of view and as such, I don’t think any of you folks will either. While the sound effects of the various laser blasts and explosions are all very run of the mill, Space Run Galaxy nonetheless has a decent backing soundtrack that help its numerous space battles thunder along. Where the game really stands out in this category however is in the voice acting, with each of the characters in Space Run Galaxy’s story being voiced by actors who are clearly having a great deal of fun assuming their roles with amusing aplomb and sarcastic verve. In case you’re wondering where the ‘galaxy’ bit comes into play, it’s in reference to the new online functionality that the game embraces. 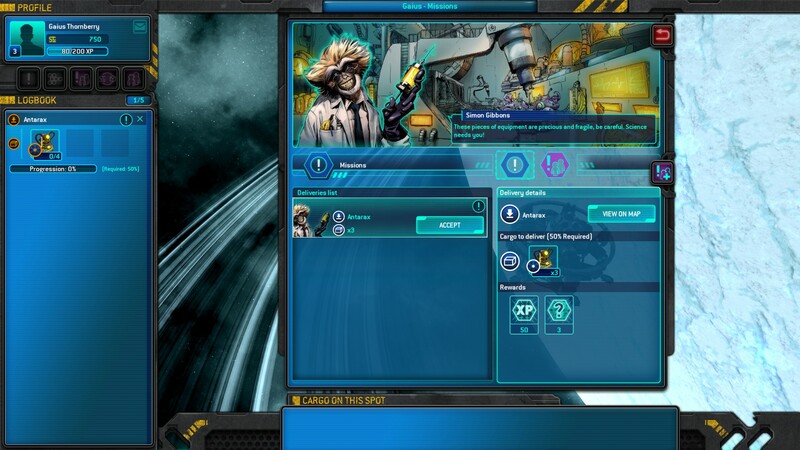 When played online, Space Run Galaxy allows players to trade gear, equipment and even take on each others missions, with the latter enabling other folks to tackle runs for you when you’re offline, only for you to come back to enjoy the spoils while they also get a cut of the profits too. It’s a nice feature set for sure and while it isn’t as encompassing as its online multiplayer remit might suggest, it still succeeds in adding one more layer to what is already an accomplished take on the genre and if you don’t like it you can always play the game offline anyway. While Space Run Galaxy pushes the envelope in many ways, there are still aspects of it detract a little from its overall sum. The difficulty spikes for example happen early on and impress the need upon the player to grind side-missions in order to obtain the necessary quality of gear to push through. The issue however, is that the enemy attack patterns and encounters always remain the same and so, somewhat unavoidably, the spectre of repetition manifests itself fairly regularly. Elsewhere, as good as Space Run Galaxy is, and it is very good, it’s undeniably very similar to its 2014 predecessor, Space Run. Because of this, players who have spent hours upon hours with that game will not find anything that’s massively different here and so for those expecting a revolution they should temper their expectations accordingly. Though not significantly difficult from its predecessor and prone to bouts of repetition, Space Run Galaxy remains a wholly refreshing take on the tower defence genre. Indeed, the focus that Space Run Galaxy places on speed and immediacy makes for a furious effort that is as challenging as it is rewarding. Getting your ship absolutely shredded and losing all your weapons only to just make it through with all your cargo intact.